I officially declare this week as Disney week. We had a major overdose of Disney Magic, starting from a visit to Disneyland HK for our vacation trip to our recent post on Disney parade and capping it off with a surprise invite to Disney On Ice Treasure Trove. Thanks to Sports Hub giveaway that we won, the family get to mark the end of the school holidays with a trip down to Singapore indoor stadium for our 2nd Disney On Ice. I had missed the first Disney on Ice the boys went to and was not quite sure what to expect. Honestly I was expecting Mickey and Gang coming out and singing M-I-C-K-E-Y M-O-U-S-E and jiving to Disney tunes ala Disney Parades but with skates on. Boy oh boy, I was proven dead wrong! Mickey did appeared in the beginning but all he did was to introduce a fantastic repertoire of famous Disney stories that enchant both young and old. The Treasure Trove kicked off with the ensemble from Toy Story. The boys were all too familiar with them especially since they had a blast at Disneyland HK Toy Story Land. Next up is Alice from Wonderland. Honestly I think the Army of cards stole the show for this segment. Next the crew from Peter Pan arrived and battle Captain Hook. The fight scenes between Peter and Captain Hook was well choreographed. However the one that got the most cheer from the boys is the sassy Tinkerbell. I guess that was not surprising given their encounter with her earlier in the week at Disneyland Hong Kong. This is a 1 Hour 45 Mins production with a break of 15 minutes in between. After the break we were introduced to the story of the Lion King . The only 'sad' part about the whole show was when King Musafa (Father of Simba) died while fighting a herd of wildebeests to protect his son. Thankfully Simba escape the Stampede and regain his throne with the help of his friends. The couple skating was simply stunning. What can you say when you see 2 lions twirling in rounds on ice? Next up are the Disney Princesses segments. From the first Disney classic Snow White, the bubbly Little Mermaid, the beautiful Tania and the spicy Jasmine, the boys were given an introduction to the charms of the Disney Princesses. Tried as the Disney Princesses did, I think it is the skating elephant from Aladdin that had caught their attention during this segment. The finale will be a major hit with the little princess in the audience. A parade of all Disney Princesses and their princes. Even Mickey and Minnie made an appearance during this finale. This is a spectacular production. The wife who attended last year's Disney on Ice said that this production was definitely much improved. The retelling of popular Disney stories with the characters effortlessly gliding and twisting on Ice is indeed a magical sight. Not only were we entertained with familiar Dianey songs, we were also well educated in Disney Lore during the show. Perfect way to spend a ' Hakuna Matata' afternoon with the boys! It had left Little Lou amazed and fixated at the performance during the whole performance. A rare feat considering how hyper he can get. 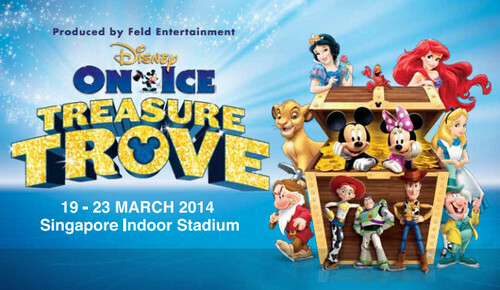 Maybe a 3rd Disney On Ice next year? Don't forget your Disney souvenirs on the way out! Get a piece of Disney home!